The hospitality of Cretan people is unbelievable and we love to share with all our friends our “food experiences” as simple gift when we visit them. Greek (especially the Creatan ones) ingredients are excellent and this improves the taste of what is prepared with them. 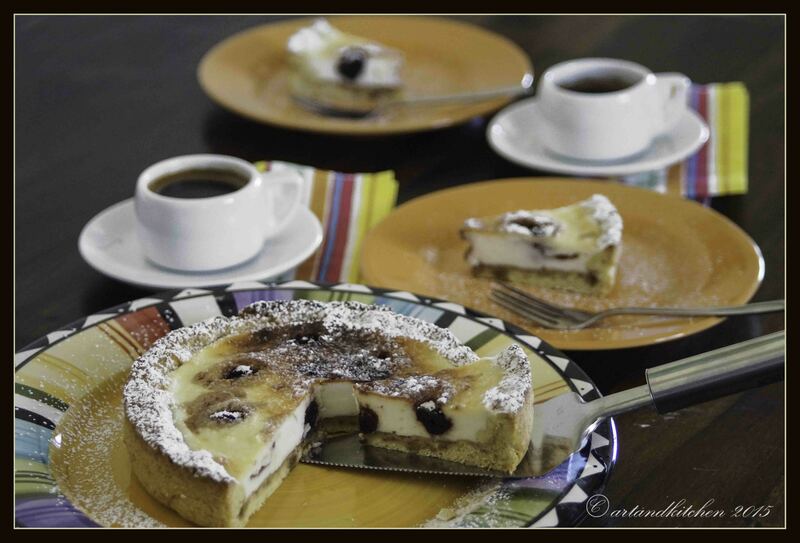 For this recipe I used fresh “anthotiro”. a traditional Greek whey cheese prepared from unpasteurized sheep’s and goat’s milk or mixtures. The smell is very mild and really does not smell like goat or sheep. I made the preserved sour cherries jam two years ago (I still had some jars) and I used the fruits to top the cheese filling and the juice (jam) to brush on the fresh baked crust. If you don’t have this I suggest to used simple preserved sour cherries (or cherries) and for brushing the jam. As mold we used the clay molds used to produce and sell the traditional Cretan yogurt covering the bottom with a disk of baking paper. This worked perfectly and we did not have problems to remove the cakes from the molds. The cakes were delicious and had been very much appreciated! Makes two 18 cm cakes or one 25 cm wide one. 1/2 teaspoon baking powder, sieved! Cut the butter in the flour mixed with baking powder and mix in the sugar add the egg and mix quickly until combined, if necessary add 1-2 tablespoon water. Roll out the dough to a disk big enough to cover the bottom and a border of 2 cm of your mold (makes two 18 cm cakes or one 25 cm wide one). Line in the mold prepared with baking paper, if you have a non-stick mold you don’t need the paper! Pinch with the fork a few times. Blind bake for about 20 minutes (see: http://www.thekitchn.com/how-to-blind-bake-a-pie-crust-cooking-lessons-from-the-kitchn-197553) or until the borders are lightly brown. 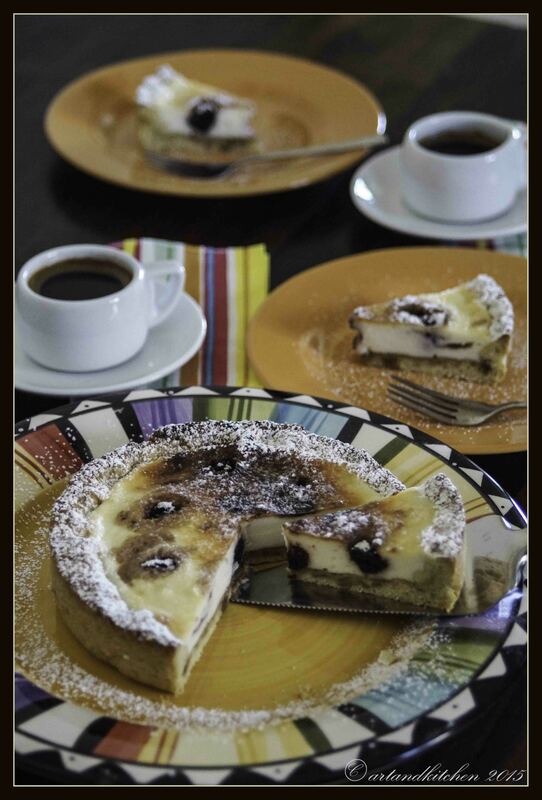 In the meantime prepare the ingredients for the filling combining ricotta, sugar, cornstarch and vanilla. Remove the crust from the oven and brush with the liquid part of the jam. Fill with cheese filling, top with the sour cherries and press them into the filling. Bake for other 15 minutes or until set and golden. 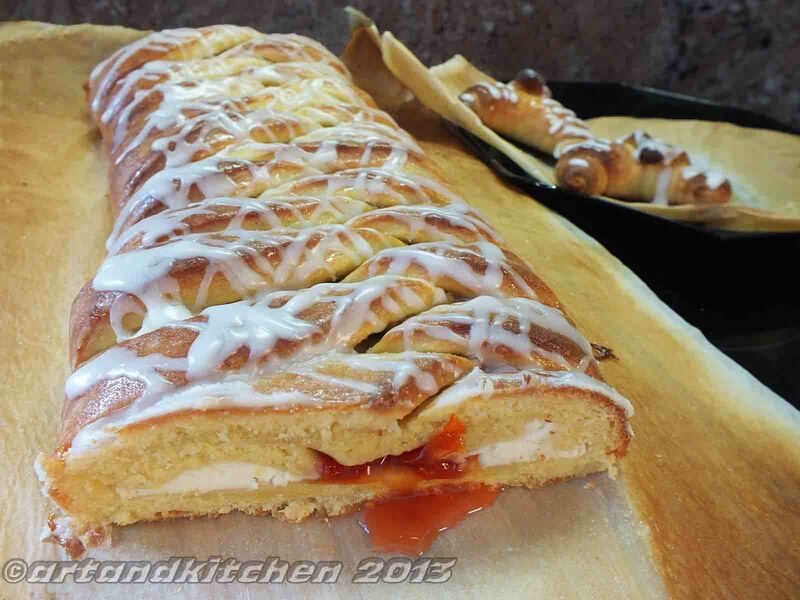 It was really a lot of work to prepare this Danish braid, but the effort was really worth. I began this challenge the day in advance folding and chilling this wonderful dough following the recipe “Danish Braid” from Sherry Yard’s in The Secrets of Baking. Finally the folded dough was in the refrigerator and I still had to take the decision what kind of filling I will take. Too late for such a decision, we went sleep. In the morning as I was checking the fridge for some inspiration, I saw ricotta and a half pot of our sour cherries jam. This is the solution. The big problem was the jam because it was really thin. For this reason I used the ricotta as a wall to prevent floating away this precious juice. I decided to prepare only one big braid instead of two. For the glaze I used powdered sugar with the addition of a small quantity of thick plain yogurt. Combine yeast and milk in the bowl of a mixer fitted with the paddle attachment and mix on low speed. Slowly add sugar, orange zest, cardamom, vanilla extract, vanilla seeds, eggs, and orange juice. Mix well. Knead the dough for about 5 minutes, or until smooth. You may need to add a little more flour if it is sticky. Transfer dough to a lightly floured baking sheet and cover with plastic wrap. Refrigerate for 30 minutes. Combine ricotta, cornstarch sugar and vanilla until smooth. Roll out the dough to a rectangle of about 20 to 18 inches (50 to 40 cm) on a baking paper sheet. Using a pizza cutter make cuts as shown in the photo. I used the leftovers to prepare two cute rolls (see photo). Braid as shown in the photos. Bake in the preheated oven at 350°F/180°C for about 25-30 minutes (rotate once after the first 10 minutes) or until light brown. I used a fan forced oven. While the braid is in the oven melt sugar with water. When the braid is done, take out of the oven and brush immediately the glaze. Stir powdered sugar and plain yogurt together until smooth but still thick (add more powdered sugar if necessary). When the braid is still warm but not hot, place glaze in a small bag, close it tight (knot) and cut off an edge. Drip glaze over the braid. Enjoy your braid with your family or friends! 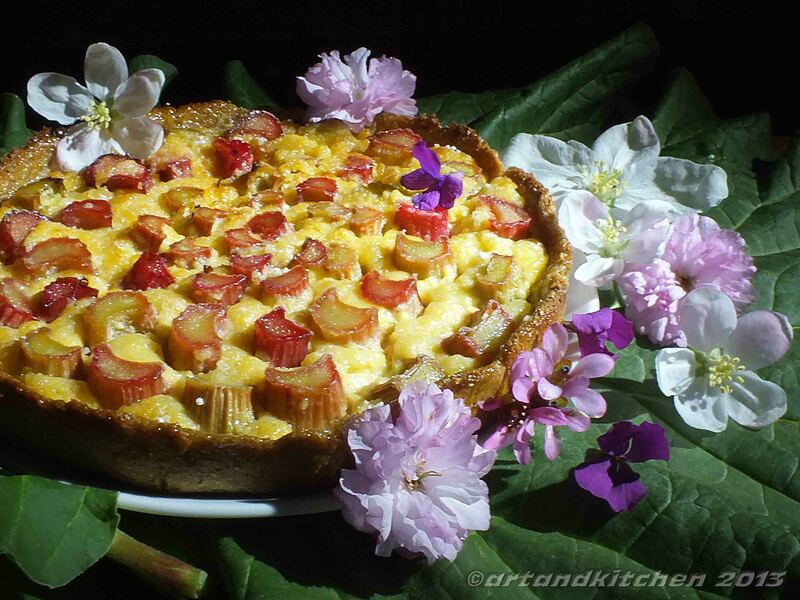 This composition was created with fresh mizithra from Crete and fresh rhubarb from our garden. Trying to make this tart more rustic and lighter I decided to try a new crust using bran instead of flour. 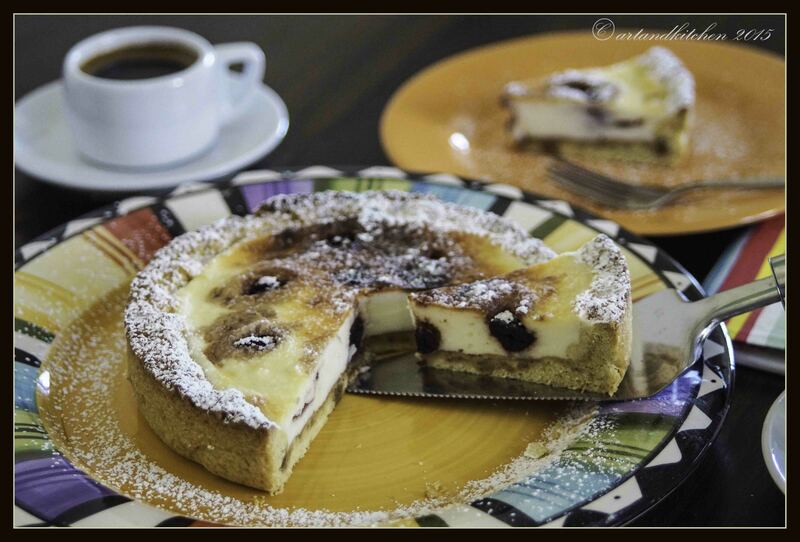 It’s a small tart of a diameter of just 16 cm and serves about 2 – 4 persons depending on the portions. The flours form the garden I used for the decorations are Japanese cherries tree, apple tree, annual honesty (Lunaria annua) and elephant-eared saxifrage (Bergenia sp.). Process both kind of bran until almost flour like. Add egg white, cheese and brown sugar, work with a fork until well combined and assembled. Bake the base for 10 minutes in a preheated oven at 180°C/350°F. In the meantime combine in a bowl with a fork the ingredients for the filling (except rhubarb and powdered sugar). Fill the bottom of the crust with the cream and arrange nicely rhubarb on in. Dust with powdered sugar. Bake at 180°C/350°F for about 30-35 minutes and serve warm or chilled.